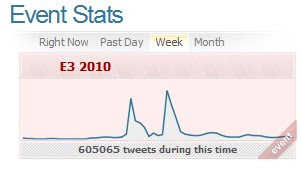 As anticipated, E3 2010 yielded a massive amount of social media chatter, including over half a million tweets in a single week! E3 2010 ran from June 15 - 17 of this year, with a Microsoft Press Conference on Monday the 14th, along with a ridiculous Activision concert that same evening. Essentially, this entire week was all E3. And according to AggreTweet, E3 was the top trending topic among gaming all 7 days. To be precise, from Saturday-to-Friday of E3 week, there was a total of 605,000 tweets. Given that I am writing this entry a little before midnight, naturally that number will change by a factor of a few thousand. However, the important take-away from this is just how accurately we can predict, track, and trend Twitter activity based around video games. You may have remembered we predicted this outcome last week. How did we know? Well that's our little secret... But we have spent a lot of time and energy perfecting our technologies here at Aggregame, and will continue to do so. AggreTweet in particular continues to prove it is the most powerful Twitter analytics software in existence, and we will be growing and expanding this technology even further in the future.